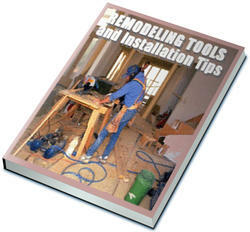 PHOTO B: Lay out and cut the side panels to shape with a jig saw guided by a clamped straightedge. PHOTO D: Glue, clamp and nail the drawer bottom and back together. Drive the nails through piiot holes, and recess the nail-heads with a naiiset. long pieces of plywood for the side workpieces. Follow the Side Layout drawing, page 2-lfj, to lay out the angled shapes of the sides. 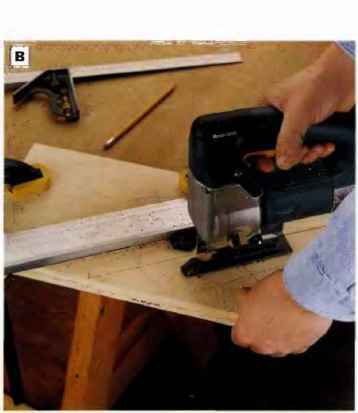 Cut the sides to shape with a jigsaw (See Photo B). © Cut the plywood bottom panel to size. 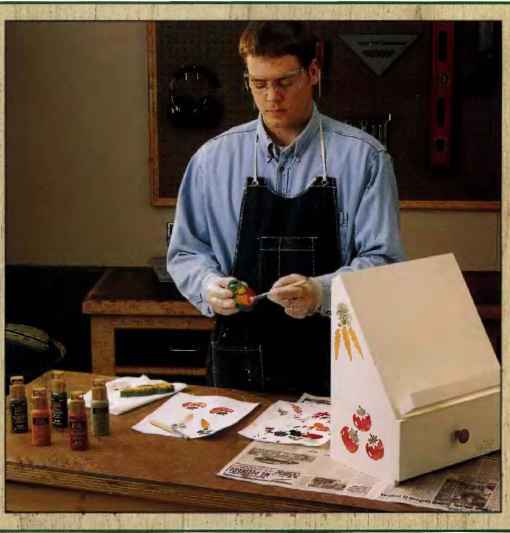 ® Build the recipe box: Draw reference lines across the inside faces of the box Rides Vi in. up from the bottom to mark the location of the box bottom. Spread glue on tho edges of the front panel of the cookbook rest, as well as on the ends of the bottom panel. Clamp the cookbook rest and the bot tom panel between the sides, configuring the parts so the project is lying on its side. Be sure the bottom panel lines up with tlie reference lines and the cookbook rest is (lush with tho angled profiles on the side panels. Drill pilot holes and drive l'/i-in finish nails tlrrough the; side panel into both the bottom and cookbook rest. Set the nailheads. Reclamp the project so the other side panel is on top, and nail these joints in the same fashion (See Photo C). Build the drawer r Kip and crosscut all of the drawer parts to size. 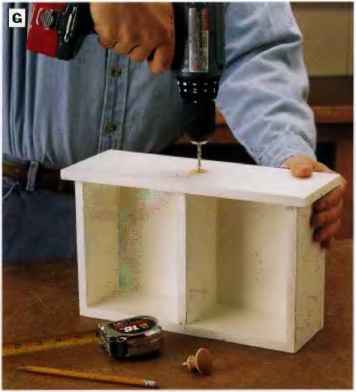 PHOTO C: Glue and nail the sides to the bottom and cookbook nest to form the recipe box. Arrange and ciamp the parts so you can naii through one side, then reclamp and fasten the other side. of the drawer bot tom before clamping the two parts together, then drill pilot holes through the bottom and into the back. 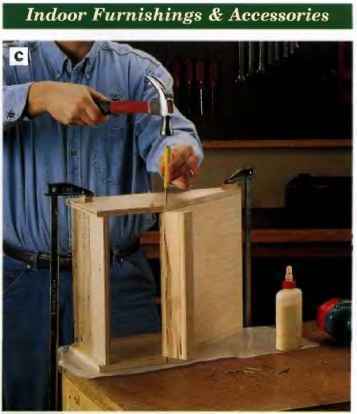 Attach the parts with 114-m. finish nails (See Photo D). 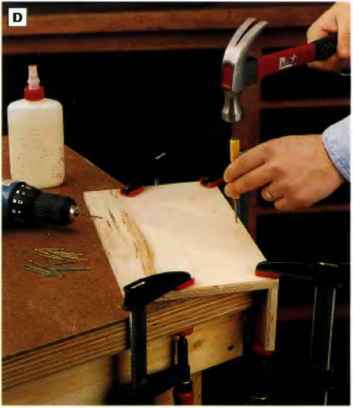 PHOTO E Fasten the drawer sides and divider to the bottom and back with the drawer arranged upside down on your bench. Glue, damp and nali these joints. PHOTO f: Instaii the drawer front on the drawer carcase with glue and finish nails. Note that the front overhangs the drawer carcase % in. on the sides and V2 in. on the top and bottom. O Add the drawer sides and divider: Mark the centerline of the drawer divider across the bottom face of the drawer bottom. 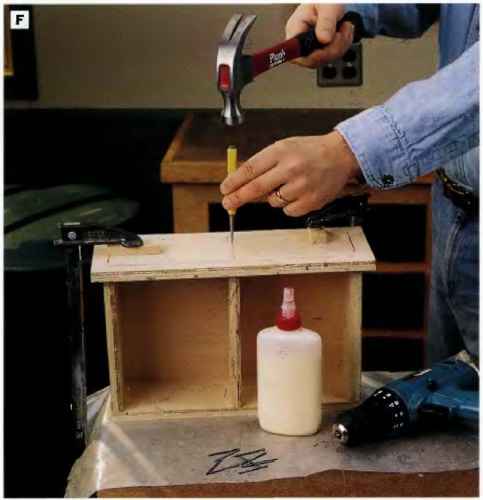 Spread glue along one short end and one long edge of the drawer sides and divider. 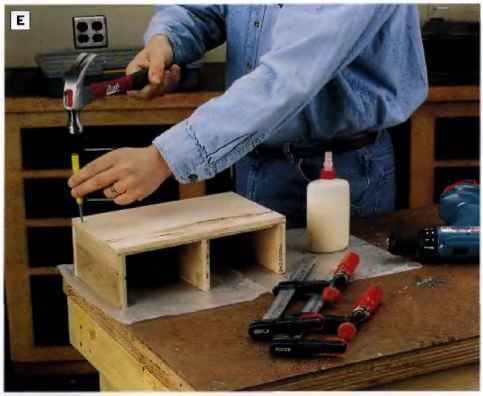 Set the drawer parts together on your bench with the drawer bottom facing up. Drive finish nails through pilot holes in the drawer bottom and back and into the sides and divider to fasten the parts (See Photo E). © Install the drawer front on the drawer carcase: Set the drawer front on the drawer carcase so it overhangs each drawer side by % in., but only V2 in. on the top and bottom. Mark centerlines on the drawer front for the sides, divider and bottom. Spread glue 011 the front edges of the drawer carcase, clamp the drawer front in place and attach it with finish naiJn. Set the nailheads (See Photo F). © Fill nailhead recesses and any other voids in the plywood wif,h wood putty. Sand the project thoroughly. © Apply primer and two eoats of paint. 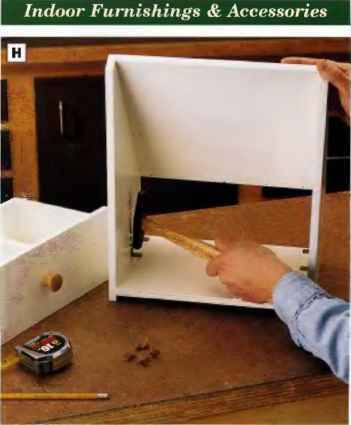 ©Install a drawer pull at the center of the drawer front (See Photo G). 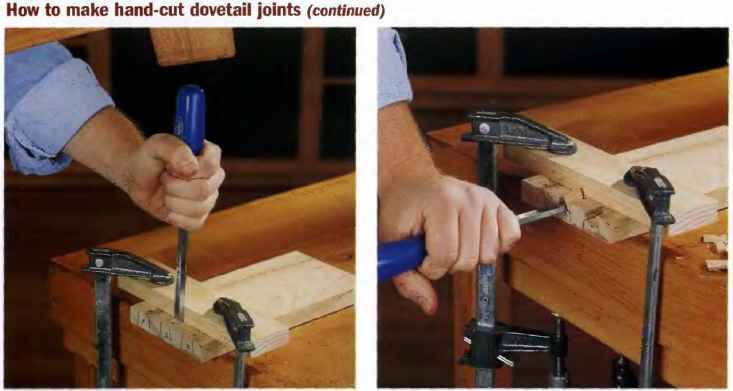 © Nail four drawer glides to the recipe box bottom so they're flush w ith the side panels. Locate a pair of glides about V/2 in. in from the front of the drawer opening and another pair 4 in. in from the back (See Photo H>. PHOTO G: Driii a piiot hoie at the center of the drawer front for a threaded drawer puii. install the puii. PHOTO H: Tack four naii-on nyion drawer glides to the recipe box bottom inside the drawer opening. The glides shouid be flush against the project sides. Decorate this recipe holder with kitchen themes using stencils or stamps available at most craft and discount stores. To transfer an image, simply hold or tape the stencil in place, apply paint In the cutout areas and lift off the stencil for reuse. If you use plastic sheet stencils, It's a good idea to apply them with gel-style stencil paint or spray paint instead of thinner, brush-on paint. Thin paints tend to bleed beneath the stenciled areas, ruining the desired shape. Another detailing option is to buy foam-rubber stamps with raised shapes that you cover with paint and stamp on the project.